The GH Series gearhead is an easy-to-use version of the RV Series reducer, featuring the high rigidity, compact size, and low backlash (less than 6 arc-min)that people expect from Nabtesco gearheads. The GH Series provides low reduction ratios (11:1, 21:1, and 31:1) and high output revolution (up to 250 RPM). 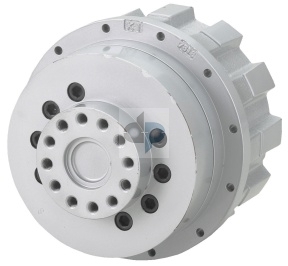 Both flange output and shaft output configurations are available for this series. This reducer features large angular ball bearings to provide large moment capacities, eliminating external support devices and simplifying installation. The GH Series gearhead is greased and sealed before shipment, and the gearhead typically can be expected to last 20,000 hours before replacing the original grease. The reducer is delivered with the motor flange, fixing bolts, and input spline for your specific application, making installation simple.